A flight simulator set in the World War II period; the game was developed by Atomic Jelly and published by Movie Games. The story focuses on the titular 303 Squadron - a Polish combat unit formed in Great Britain. No. 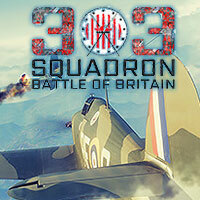 303 Squadron: Battle of Britain for PC is a flight simulator developed by Atomic Jelly and published by Movie Games. Both the developer and publisher of this game are parts of the PlayWay group. The game's story focuses on the titular 303 Squadron – a Polish aircraft team formed in Great Britain in 1940. No. 303 Polish Fighter Squadron fought under the banner of the Royal Air Force and played a key part in the Battle of Britain. The players are given an opportunity to get acquainted with stories of particular pilots, maintenance workers, and other people who worked in the aircraft base in Northolt, as well as to take part in authentic skirmishes from the period – the course of events was recreated based on historical evidence. When developing the gameplay formula for 303 Squadron: Battle of Britain, the creators placed an emphasis on quick and dynamic air battles. The mechanics underlying the experience have situated the game somewhere between simulation and an arcade experience. Although the game was designed with both total novices and experienced players in mind, the creators managed to express the specifics of air battles that took place in the period, as well as of the planes used in combat back then. Between the encounters with Luftwaffe, the player visits the aforementioned base, which was designed here on the basis of maps from archives; the player is free to explore the facility in any way they want. One can have their plane repaired here (which is, Hawker Hurricane), or install useful modifications, but also search for collectibles hidden here and there. Apart from the main missions, one has a series of side assignments to be completed – those were also based on historical events from the World-War II period, though not necessarily connected to 303 Squadron. The side missions take the player to other European military theaters. 303 Squadron: Battle of Britain for PC offers high-quality 3D visuals. The game's plane models filled with details are especially worth noticing.